John: We’re heading to the office now. Going to print off Katherine’s project and glue it to the project board. Me: Okay. I’m going to tidy up and do some cooking. John: Sounds good. Oh! I turned the dishwasher on and it made a weird noise, so I turned it back off again. Me: Right. Good to know. John: We’re home! 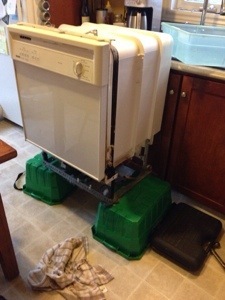 Got everything done except for the… WHAT THE HELL HAPPENED TO THE DISHWASHER? John: You going to elaborate on that at all? Me: It’s broken-broken. As in “does not work” broken. John: Why is it in the middle of the kitchen floor? Me: I put it there while testing to see where the problem is. I flipped the breaker…. Me: I FLIPPED THE BREAKER, unscrewed it from the counter and lifted it up onto those blocks. See? Deadlifts are a practical skill! Me: Then I drained it, checked the hoses and intakes for blockages and reconnected it. Turned it on to test it. The motor for the pump is burned out. I could replace it, but the parts place is closed today and the dishwasher is almost eleven years old and has other issues. It’s probably a better idea just to pick up a new one tomorrow. I’ll connect it up. When I decided it was broken, I couldn’t see the point in putting it back. John: You could replace it…. ? Me: Yes. I’ve done this twice in the past. I fix pumps in washing machines, too. John: You fix…. ? How do I not know any of this? Me: You spent a lot of time at the office? And I’m rather unlike most of the wives of your colleagues. John: Clearly. Christ, there are tools everywhere here. Me: Yup. Screwdrivers and the drill for taking the screws out of the underside of the counter. John: And a hammer. The really good Estwing hammer. Me: Yes. I didn’t actually have a specific purpose in mind for the hammer, but you just never know when you might need one and when you need a hammer, you really need a hammer. John: No, dear, that’s BUCKET. When you need a BUCKET, you really need a bucket. Are you done with these? Me: Until tomorrow. When I pick up the new dishwasher.